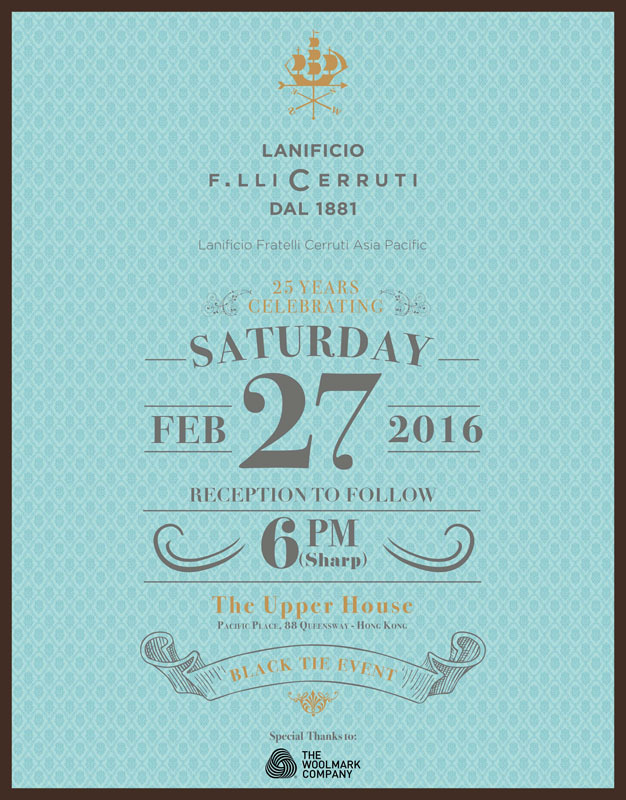 The historic Lanificio F.lli Cerruti dal 1881, in partnership with The Woolmark Company, will celebrate the 25th anniversary of the Hong Kong Head quarter. Opening in 1991, the office is fulcrum for Asia Pacific market of Lanificio F.lli Cerruti and Lyria fabrics. An exhibition with tailor made clothes will be held within the beautiful setting of The Upper House, Pacific Place, Hong Kong on the 27th of February at 18.00, black tie event by invitation only. Guests of this event the best tailors of Asia Pacific, big distributors, representatives from most important Asian brands and leading figures in Hong Kong. The patterns of the exclusive fabrics he has continually produced in the last 65 years, float through different eras and pass under the hands of skilled craftsmen as well as technical experts of industrial productions, creating a style for everyday use and not an artificial one. The Lanificio F.lli. Cerruti S.p.a. was established in 1881 in Biella, the cradle of Italian textile industry founded by Stefano, Antonio and Quintino, brothers Cerruti, descendants of a family dedicated to the textile industry since 1700. The company grew steadily over time and after the Second World War, the production focused exclusively on the highest quality fabrics. Since 1951 Lanificio F.lli Cerruti – which now employs 400 workers – is directed by Nino Cerruti, who today, after 40 years as an acclaimed fashion designer, has transferred his great experience to the production of fabric collections for Men, Women and Designer destined for the more demanding and sophisticated clients. As the global authority on Merino wool, The Woolmark Company plays the key role of main partner of the project. The beauty and the quality of the merino wool is well expressed through the exhibition, underlining the strong relation between this noble fibre and Lanificio F.lli Cerruti, who has always preferred it, not only for formal collections, but also for casualwear and everyday wardrobe, thanks to the excellence, the qualities and the versatility of this marvelous natural fibre.